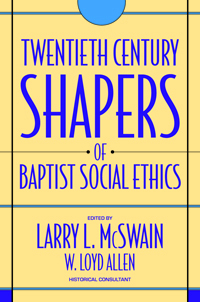 Twentieth-Century Shapers of Baptist Social Ethics provides an overview of the major historical framework within which Baptists emerged with significant contributions to Christian social thought and action in the twentieth century. Baptists have few original towering theologians in the tradition of Augustine, Acquinas, Luther, Calvin, Kierkegaard, Edwards, Brunner, Barth, Kung, Pannenberg or a host of non-Baptist contemporary thinkers. As an activist people, Baptists can lay claim to an impressive array of teachers, writers, and activists who have shaped a century of thought and action within both the Church and the larger social arena, including two recipients of the Nobel Peace Prize. This book provides a summary of the life, principal ideas, writings, and most significant contributions of nineteen Baptists since 1900. They interpret the connections between the various persons, institutions, and streams of thought that flow through the narratives of a biographical ethic. Many contemporary students and church lay leaders are unaware of the meaningful contributions of the persons described in these descriptions. A concluding essay identifies key issues and potential trends for Baptists as the post-modern era of the twenty-first century develops.